As I said some time ago, I stopped adding new blocks to the game and instead I wanted to focus on implementing more important things in order to get the game ready to be released. At that time I wasn't really happy with the way the game looked (there were almost no textures,...) and I knew that many icons where missing in the menus. So I decided to work on the graphics. The first thing I wanted to change were the standard blocks themselves. They really needed some textures as they looked rather boring. I started to experiment with different textures and filters. For me it was really important that the blocks should have a nice texture and at the same time each material should have a specific colour on which you can identify it (even if the camera is further away and you can't see the texture anymore). It took me quite some time to get results which looked good even if many blocks are stacked over each other but I'm quite happy with the current design. 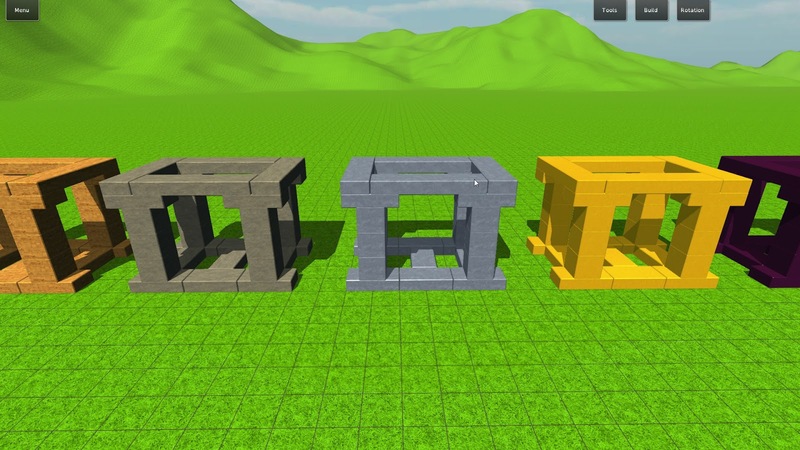 The next step was to create new models and textures for special blocks. I reused some of the textures and gave them different colours. At this point I realized that TNT-blocks and bombs looked better now but there was no graphical feedback when they were triggered. So I quickly scripted a blink-effect which set the main colour of the block to red every second. The list of missing icons turned out to be longer than I expected (over 30) but creating those didn't take very long as I already had a concept of how the buttons should look. What's also very important is that I could fix a ton of bugs in the last weeks and restructured some of the code to make it easier to add new blocks. This was something that took much time in the last 5 weeks but it was really necessary as the buglist continued to grow. What I should also mention is that the envirnment hasn't been changed, I will be working on that in the next weeks when I start to create the first map which will be in the final version of the game. After this is finished I plan to create the first trailer which should show some nice footage and also explains what the game is.